Address: The Links, Carnoustie, DD7 7JE. The Aboukir is a friendly and inviting hotel, bar and restaurant owned by local proprietors David Scorgie and Frank Ross. It is a 5-minute walk from Carnoustie High Street and is within walking distance of the famous Carnoustie Golf Course. Address: 38 Ireland Street, Carnoustie, DD7 6AT. The Kinloch Arms Hotel is located on the east coast of Scotland in the picturesque town of Carnoustie, in the county of Angus. We are a two minute walk from the charming main line train station and seafront with its miles of beautiful sandy beach and where recent upgrading of the beach area has resulted in an extensive coastal path to walk or cycle. Address: Station Road, Carnoustie, Angus, DD7 6AR. Park House offers luxury, 5-star bed and breakfast accommodation in Carnoustie. Located close to the town centre, Park House is within easy walking distance of Carnoustie Championship Course Originally built in 1808 for a local shipping magnate, Morven House has been extensively renovated to provide high quality bed and breakfast accommodation in classic surroundings. The house is situated on the south side of Carnoustie with panoramic views over the championship golf course making Morven House an ideal location for golfing in Scotland. If you wish to play golf in St Andrews the courses are just 20 minutes away by car. Address: 28 West Path, Carnoustie, DD7 7SN. 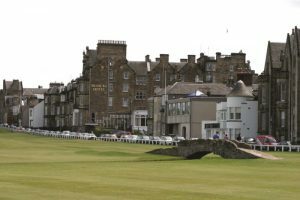 Macdonald Rusacks Hotel is within a sand wedge of the 18th hole of the world-famous Old Course. Stylishly remodelled on a golfing theme, Macdonald Rusacks Hotel offers luxurious accommodation occupied by some of the great names in the game’s history. Unquestionably Scotland’s greatest golfing hotel, we even have a dedicated Golf Concierge so you won’t miss a thing. A stylish contemporary hotel, we’re located in the heart of the new City Quay development in Dundee. We’ve stunning views of the Quay as well as the Tay River & Bridge. And we’re surrounded by businesses, thriving nightlife and some of the city’s best shopping. Address: 1 West Victoria Dock Road, Dundee, DD1 3JP. A modern structure of gleaming glass and steel, the Holiday Inn Express Dundee is situated In the heart of the city, with a number of good quality restaurants and bars only a two minute walk away. The hotel has 95 en-suite bedrooms, power showers, complimentary breakfast with two hot options and free WIFI throughout. A licensed bar with a good selection of beers, wines, spirits and soft drinks is available. Each room has wide screen televisions with over 90 Freeview channels. Carnoustie is a short drive away or can easily be reached by train. Address: Holiday Inn Express Dundee 41 Dock Street, DUNDEE, DD1 3DR. Set in private wooded grounds overlooking the River Tay, this former mansion house offers a stylish, convenient base for Dundee and the surrounding area; it has all the benefits of a city centre hotel, being within a five minute drive of the city – but thanks to its private setting, the city could be miles away. Address: 371 Perth Road, Dundee, DD2 1PG. This Dundee Hotel, is set in its own stunning grounds, surrounded by the unspoiled landscape of the Glens, this spacious and stylish hotel is one of the leading wedding venues in Dundee. Address: Kingsway West, Dundee, DD2 5JT. Address: Old Station Road, St. Andrews, KY16 9SP. The Best Western Woodlands Hotel is one of Dundee’s finest, located in mature wooded gardens, close to the seaside village of Broughty Ferry. Address: 13 Panmure Terrace, Broughty Ferry Dundee, DD5 2QL.